AIDAN CONNOLLY has revealed that Andrew Robertson’s Champions League heroics sparked a Dundee United reunion. However, there will be no room for sentiment as Dunfermline’s latest summer signing goes head-to-head with his former club in the Championship next term. 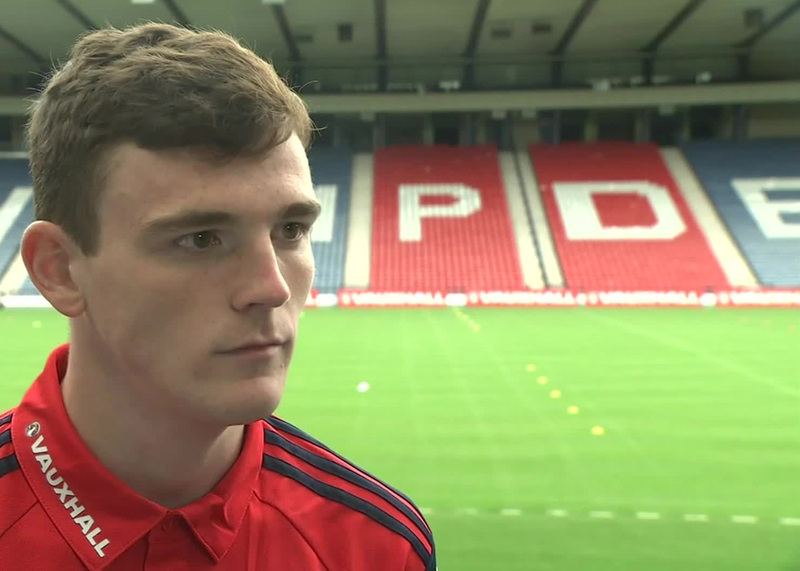 Connolly is firm friends with Robertson, with the pair even joining the Tannadice outfit from Queen’s Park together on the same day in June 2013, and has been dazzled by his pal’s spectacular rise to prominence with Liverpool. The duo were inseparable with Ryan Gauld and John Souttar, now at Sporting Lisbon and Hearts respectively, with the precocious United kids all sharing a flat. So, Robertson – despite ultimately slumping to a 3-1 defeat against Real Madrid – had plenty of support as from back home as ‘Soapy’ got the band back together for his big night in Kiev. “I actually watched the Champions League final at John Souttar’s house,” smiled Connolly. “A lot of the old Dundee United boys like Ryan Gauld came through so it was good. They are all great lads and we have a lot of good memories from our time at the club and sharing a flat. “I have hardly seen them for the two years I was down south but we all went to Soapy’s [Souttar] house and it was just like old times. “I thought Andy was brilliant in the final but it was just a bit weird that we had all played with him and he is now at that level. It is surreal, unbelievable – like a dream. I’d imagine it is like a dream for him as well! While Robertson has enjoyed unmitigated success since departing United, Connolly has endured dizzying peaks and troughs at York City. Former Tangerines boss Jackie McNamara took the waspish winger to York City in 2016 and proved unable to stop the club from enduring successive relegations from League Two to the National League North. Nevertheless, Connolly netted an unforgettable last-gasp winner as York beat Macclesfield Town 3-2 at Wembley in the 2017 FA Trophy Final. Close to 40,000 fans were in attendance that afternoon. And he is adamant that he is returning to Scotland a more complete player after penning a one-year deal with the Pars. “I had a few highs and lows at York,” he continued. “The football was different and it is a lot more physical. “Scoring at Wembley was an unbelievable feeling. I didn’t know what to expect but when we turned up at the stadium, it is magnificent. You can’t have a bad touch on that pitch. It was just a fantastic experience.